Voyager and its characters belong to Paramount Pictures. No infringement intended. Spoilers: Resolutions, Day of Honor, Waking Moments, Hunters, Hope and Fear and hints of Night. Chakotay watched the crew work their way through another disappointment. The promise and the hope that Arturis had held out had been dashed by the revelation of his plot to trip them into being assimilated as his people had been. Keeping tabs on the crew wasn't too difficult. Neelix was always on the look out for someone who needed a morale boast. And if his style of cheerfulness didn't seem to help, he would enlist Chakotay's help. The rest of the senior staff would, also, talk to him about problems they encountered as well. About two weeks later, Voyager entered a part of space that seemed devoid of distractions, the problems began to show. "Every sailor's nightmare," he thought as the void added to the aftermath of the other ordeal. But Chakotay was surprised as to who seemed to be the most effected. Tom Paris seemed to be spending a great deal of his spare time on the holodeck as Captain Proton. The helmsman and the doctor had more than one argument over the scheduling. B'Elanna had told Chakotay of her concern as well. However, it was Captain Janeway's increasing isolation from the crew and the ship's business that had Chakotay deeply concerned. He hadn't sure what to do until Neelix came to see him. "Commander, thanks for seeing me." Neelix was ringing his hands. "I'm worried about the captain. Today was the third in a row that she has asked me to bring her dinner to her cabin." He paused as if he couldn't bear to say the words. "She didn't order coffee and when I asked her about it, she told me she didn't want any," he blurted out, shaking his head as in disbelief at what he had just said. "I think the doctor should have a look at her." After the Talaxian left Chakotay's quarters, Chakotay pondered his options. He would need the help of the doctor. That was when the idea hit. "Enter," she said flatly after checking with the computer to see who was there. Kathryn was standing by the portals, dressed in her uniform shirt and trousers. There was an unsettling look of apathy in her eyes as faced him. "The crew has been asking after you." "Give them my regards." She turned her gaze back to the blackness outside the window. "Kathryn, I've come to take you to the holodeck." Chakotay watched for the usual Janeway spark. The patented Janeway glare and hands-on-hips stance cheered him. Chakotay cheerfully responded, "As of now and for the next week, we have begun training exercises. In this scenario, you and I have been incapacitated. Tom and B'Elanna will be taking our places. Tuvok will be on duty as advisor so we have nothing to worry about." When all it took was the look of determination in Chakotay's eyes took the fight out of her. Kathryn wondered if maybe she did need a break. She shrugged her shoulders. "For the record, I'm doing this under protest, Commander." "Noted, Captain." Chakotay was excited, but wisely refrained from showing it. "I'm not sure about this." Kathryn's voice was full of doubt. Chakotay was soothing, persuasive. "We're in a quiet region of space. Little time off won't hurt." To top it off, he focused his full smile on her, as he said, "Besides, it's only for a week, Tuvok is still on the bridge, so what trouble can Tom get into?" "Who knows with Tom?" She tried to sound skeptical, but Chakotay's dimples worked their magic. Kathryn sighed. "Okay, but only for one week." Checking the chronometer for the third time in five minutes, Chakotay began to get nervous. Tom's tropical resort program was running, and he was wearing a blue Hawaiian shirt and black pants. He had insisted that Kathryn come in civilian clothes, but maybe she had second thoughts about the whole thing. His hand was over his commbadge when the holodeck doors opened. What Chakotay didn't know was that his captain had been standing just outside the holodeck for the last five minutes. She was still unsure about spending a week there without the duties of the office on her shoulders. And furthermore, the sleeveless dress Kathryn wore made her feel even less captain-like. Ordering a site-to-site transport to avoid as many crewmembers as possible, she remained at the entrance, screwing up her courage to go in. The sound of footsteps finally pushed her to action. "She took his breath away" ceased to be a cliché as Chakotay saw Kathryn enter the room. The red and yellow hibiscus on a white background set off the creamy white of her skin and the red of her hair. She had even replicated two matching flowers, which were fastened in her hair above one ear. "Kathryn." Chakotay finally spoke just above a whisper. Then finding his voice, he exclaimed, "You look wonderful!" The frank admiration in his voice caused her to blush. "Thank you," was all she managed to say. Seeing her discomfort, Chakotay changed his tone. "This program has some great features, Kathryn. Tom is nothing if not inventive. But before we explore, I ordered iced caramel coffees for us." He gestured for the holo-waitress who was waiting at the small bar. After they were seated in large cabana chairs, the waitress set the drinks on the table between them. Kathryn grinned as she lifted her glass. The drink was cool and refreshing, the perfect balance of sweet to coffee. She sighed after she took a slip. "Delicious! One of Tom's program features?" "No," he said, chuckling. "My recipe." "I hope you will share it with me." Kathryn smiled over the rim of her glass. Chakotay held up his hand and answered for her, "What is it, Paris?" "Uh," he said hesitantly. "I was hoping to speak to the captain." "You are captain for the week. We are on shore leave." "Yes, but," Tom stammered, "there's a message from Naglian freighter captain who is about a day away from us. He wants to negotiate a trade." "Deal with it. You know the regs. Chakotay, out." Seeing the concern in Kathryn's eyes, Chakotay explained, "It'll be fine. Tom is capable, and Neelix will help him. Relax, this isn't something to go to red alert over." Changing the subject, he asked, "Are you up to a game of volleyball after we finish here?" "I won't be able to eat another meal for the rest of the week." Kathryn sighed contentedly as she pushed back from the table. She followed Chakotay to the balcony that overlooked the beach as the last of the sunset stained the sky with oranges and pinks. They sat together in silence on the cushioned bench. The sounds of the sea surrounded them. Kathryn sighed again, letting the mood and the atmosphere of the moment pull her into a deep state of contentment. "Thank you, for all this." Chakotay only smiled in response. She chuckled. "I know, I know, you would love to say I told you so, but you're my first officer for a good reason. This is one of them. I'm really enjoying myself." Almost as if some perverse entity such as Q were listening and wanted to spoil things, Neelix appeared behind them. "Captain, I must speak to you. That Tom Paris is going too far this time!" His whiskers twitched excitedly. Chakotay was up and at Neelix's side, before the chief cook could say another word. "Pardon us, Captain, I see that there's something I must deal with." With that he maneuvered the Talaxian back into the main room. "Neelix, what about Tom being acting captain do you not understand?" Chakotay's tone was stern. "You don't understand, Commander," Neelix spluttered. "Tom is talking about trading away our leola root supply! The message from the freighter asked specifically about leola root." Garnering all of the self-control he could to keep from laughing, Chakotay tugged on his ear. "Neelix, I'm sure that Tom will do what is best for the ship. Now please leave, and don't come back. This holodeck is off limits to the crew for the rest of the week." Chakotay ordered the computer to lock the holodeck doors after the dejected Neelix left. He found Kathryn still seated just as before Neelix came. "Poor Neelix," she said in sympathy. "He isn't used to Tom in this kind of role. Though it might be good for him to work with someone besides you and me for a change." "He'll be fine." Chakotay grinned at the secret knowledge that the ship might end up leola root free. "Now, let me tell you some of my plans for tomorrow." "I'm starved!" Kathryn sat down and grabbed a roll from the basket on the table. "I was sure that I couldn't have eaten any more this year after that picnic lunch." Taking a bite, she chewed it appreciatively. After swallowing, she gestured at Chakotay as he brought a platter of food to the table. "Are you feeding me holo-food?" Shaking her head, she answered her own question, "Holo-food could never taste this good." Chakotay laughed at her obvious enjoyment of the food before her. "Food always tastes better after exercise." It was Kathryn's turn to laugh. "Exercise is a mild word for what we did today. I never thought I'd enjoy rock climbing so much. I'm just glad that the safety protocols were on when I slipped. Tuvok might have thought you were trying a different type of mutiny if I ended up with a broken leg." "Maquis' mutinies are more subtle than that." He winked and began to eat heartily. Later as they sat together the small sitting room in Chakotay's suite, sipping wine, they were interrupted again. "Paris to um...uh, Chakotay." Tom had learned a little from the last time. It was Chakotay's turn to sigh. "This better be good, Paris." His voice was soft but menacing. "It's B'Elanna, she's having trouble. It is hard for her to do your job, Chakotay." He lowered his voice, "She isn't as diplomatic as you are." "The Captain and I have perfect confidence in her abilities. She has been chief engineer long enough to know how to deal with the crew." "But Chakotay," Tom's voice took on a whining quality. "She's taking things so personally, too much to heart. We were supposed to have a date tonight. She cancelled it, citing protocol and having to counsel Henley about a personal problem." Kathryn grinned as she touched Chakotay's hand. "Hey, Tom, do what I do. Read reports. There are always plenty of those to take your mind off other matters." And before Tom could speak again, Chakotay cut the communication. Taking her hand in his, he leaned closer and whispered in Kathryn's ear, "I think you're beginning to enjoy your time off." When she turned to look at him, Chakotay was surprised by the expression on her face and by how close her face was to his. Her voice was husky and low when she said, "I can't begin to tell you how much." Kathryn leaned so close that he thought for a moment that she was going to kiss him, but at the last second she pulled away and stood to her feet. "I'd better to go now." Kathryn stretched, her arms high over her head. "I want to have a long soak in the marvelous bathtub in my suite before I go to bed." She headed toward the door. Chakotay followed her, ready to say, "goodnight," when Kathryn turned to face him. "I look forward to what you have planned for tomorrow." Giving him a slow wink, she left him, speechless. Laughing so hard that she could hardly breathe, Kathryn plopped down uncaptainlike into her favorite chair on the resort balcony. Almost immediately she was served iced coffee by one of the holo-staff. "Oh, Chakotay, today was so much fun. I had no idea that Vulcans could be so funny." "I'm sure that our tactical officer would be insulted by my programming them to build sand castles." Chakotay chuckled as he sat down next to her. "They certainly were logical though." "It will be our secret." Kathryn leaned over the chair toward him, looking around her before whispering, "Just make sure you delete the characters before we go back on duty." They sat together in silence for a while, enjoying the view as well as the company. Kathryn marveled at how relaxed and at ease she felt. She knew full well that if she had been alone, she would have been trying to sneak into the computer for details of the ship's daily activities. Chakotay was a wonderful friend and entirely too handsome. If only protocols were different. Willing her thoughts to safer matters, Kathryn asked, "What are the evening's plans?" "As I said before Tom is inventive." Chakotay grinned at Kathryn's show of interest. "There is a small club down the beach a few kilometers. It features a luau and hula lessons. Are you up for dinner and dancing lessons?" "I must check my date book." Kathryn made an attempt to search for one, before she spoke again, grinning. "Oh, that's right, you're in charge of the calendar. Dinner sounds perfect. I'm not so sure about the hula lessons." Finishing off the last of her drink, Kathryn stood up and announced, "I need to clean off the sand and change. See you later." Chakotay watched his captain walk away. The time off was certainly enhancing Kathryn's beauty. In just a few days, her skin had taken on a golden color. Her face seemed younger and softer as if the stresses of command had been erased. At that moment he wished for more than just a few days to spend alone with her. Clenching his fists at another interruption, Chakotay's answer was curt, "What now, Paris?" "The leola root deal fell through," Tom whined dejectedly. "Neelix' clothes offended the freighter captain so much that he almost kicked us off his ship. He left immediately, warning us that this region of space didn't look kindly on such insults." "Didn't you look into Naglian customs before the negotiations began." "Neelix said that was his job as ship's ambassador." Chakotay shook his head, "My people have a saying. 'If you go fishing with a bear, don't put him in charge of the catch.'" Tom's sigh could be heard over the comm. "Are you sure that you and the captain aren't ready to be in charge again?" Seated around a large fire pit outside the small hut behind them, Kathryn and Chakotay shared a large plate of various roasted fruits and vegetables. After savoring a final bit of juicy warm pineapple, Kathryn chuckled. "I'd always thought they served roast pig at a luau." "Okay." Chakotay shrugged his shoulders. "I took a few liberties with the menu. I hope you aren't disappointed." "Oh no, I've never cared for pork." She wiped her hands on a moist towel and sighed contentedly. "I've eaten all too well this week. This was refreshing and light." Soon the rhythm of drums and peculiar sound of conch shell horns could be heard. A young native boy, dressed only in a grass skirt and lei, began lighting torches around a small raised area. When all were lit, a similarly-dressed man and woman arrived on the stage. "Aloha, wahines and kanes! We hope that you have enjoyed our feast." The holo-characters who were seated on the sand joined Kathryn and Chakotay in applauding. Leaning her head on Chakotay's shoulder, Kathryn tucked her arm under his, forgetting everything but the moment and his company. She laughed as she watched the would-be dancers try to master the hula. Chakotay comprehended little of what was going on in front of him. All he could do was rejoice in how comfortable Kathryn seemed and that she was pressed so close to him. Covering one of her hands with his, he tried to focus on the entertainment. And just in time, for the dancers were standing in front of them, coaxing them to the platform. "It's your turn to learn the dance of the islands." Kathryn and Chakotay were given costumes to wear, complete with grass skirts. After a few amusing tries, they learned the basic moves and even a few simple hand signs. "I know what you can present at the next talent night." Chakotay watched as Kathryn gently swayed her hips to the music. "You are a natural." The admiration in his voice caused her to color and miss a step. "I certainly will not do this in front of the crew!" "Well, maybe I would rather have a private performance." "In your dreams!" She slapped his shoulder lightly. A slow, sensual smile spread across his face as he agreed. "Of course!" The mood had suddenly taken a turn that Kathryn was not exactly comfortable with. For a few seconds she sought to get back the ease of early in the evening. "Could we walk back now? I'm tired of dancing." Chakotay understood what she wasn't saying; so after discarding his costume and helping her untie hers, he helped her down from the stage onto the sand. Because he was afraid that she would retreat further, he released her hand when they reached the beach. Kathryn was quiet for several minutes as they ambled down the quiet stretch of sand. The week was almost over, and despite all of her misgivings, she had to admit that the time away from the burden of her duty had refreshed her body and soul. She glanced over at Chakotay. How great it had been to spend all of this time with him, to able be to reach out to touch him at any time she wished. How wonderful it would be if she were able to kiss him. What would it hurt to kiss him just once? Would he let her get by with just one? Would she be able to stop with one? "No, I can't chance it," she unknowingly declared out loud. "Oh, I didn't mean to say that aloud. It's nothing." Chakotay stood in front of her, taking her hands in his. "What is it, Kathryn? You can tell me." Shaking her head, she avoided looking into his eyes. "I can't." Although he wanted desperately to press her for answer, Chakotay cared too much to do it. Instead he put one arm lightly over her shoulder. "Okay, let's keep walking then." Grateful that he had dropped the matter so quickly, Kathryn didn't object to his liberty. Instead she put her arm around his waist, relishing the closeness while she could. It felt so right, so ideal that she wanted the walk to last a long time. When they drew close to the resort, both were reluctant to go in so they continued their slow pace passed it and on down the beach. "I really am glad that you talked me into this week off." "Maybe you will listen to me more often," Chakotay quipped lightly. Kathryn snickered and said ironically, "I always listen to you." She could both feel and hear Chakotay laugh as he responded, "That isn't what I mean." With a bit more seriousness, Kathryn agreed, "Yes, I know I don't take your advice often enough. I'm just a little stubborn." "Yes and that is one of the things I love about you." As soon as the words were out of his mouth, Chakotay regretted it. He held his breath, sure that she would pull away from him again. "That surprises me," she said calmly, "considering how obstinate I can be." Chakotay nearly stumbled. Kathryn's easy acceptance of his declaration astonished him. Unable to think of a thing to say, he kept walking. A few moments later, Kathryn changed the subject with a big yawn. "Oh, I'm sorry but I suddenly getting sleepy." She leaned her head against his shoulder. "And before you say it. You aren't boring me." He chuckled as he unexpectedly lifted her in his arms to carry her. Chakotay was suddenly filled with joy and boldness. "Chakotay, put me down this minute!" she laughingly ordered. "Oh no!" Chakotay answered playfully, holding her small frame close, "I must assume that you are nearly dead on your feet. Kathryn Janeway doesn't admit to being tired." Deciding to stop even a token struggle so that she could enjoy the sensation of the being tucked near to Chakotay chest, Kathryn took a deep breath and relaxed. This was where she belonged, listening to the heartbeat of the one she loved. The quiet but certain knowledge didn't shock her as much as she thought it would. And although she wasn't yet sure how she would act on this awareness of her feelings, she knew she could no longer hide from it behind protocols. "Are you asleep?" His voice rumbled softly in her ear. Kathryn opened her eyes and blinked at the brightness of the indoor lighting. She hadn't been aware that she had closed her eyes. "No, I was just resting my eyes." The drowsiness in her voice told a different tale. Chakotay carried her through the lobby and down the hall to her suite. He softly gave the command that opened the door. Striding with purpose into the bedroom, he put her gently on the bed. "Sweet dreams, Kathryn," he said. Then he kissed her forehead, covered her with a blanket, and turned to leave. "Aloha, Chakotay," Kathryn whispered as she drifted off to sleep. When Chakotay reached his own room, he didn't go to bed right away. He stood out on the balcony and relived the wonder of evening. Would he be able to go back to the way things were, like he had been forced to after Voyager had come back to rescue them from their exile on New Earth? Shrugging his shoulders against this latest little twist in his fate, he headed for bed and for what was likely to be a sleepless night. Just as he was slipping under his coverlet, the comm sounded, "Torres to Chakotay." "Yeah, B'Elanna?" Folding his arms under head, he smiled and said with warmth, "It's a little late." "I have to know how you keep sane as first officer. I love Tom and it has been tough staying away from him these past few days." She paused to take a frustrated breath. "Besides all these people coming to me with their problems. I can rebuild a warp core, but I want to scream every time someone asks me for personal advice." "There isn't any reason that you would have to keep your distance from Paris. This is only a practice." "No, Chakotay, I have to do this just as if I was the first officer." Her tone of voice changed to a teasing one. "At least I've only got a couple more nights left." "You didn't answer my question, old man." B'Elanna prodded. "How do you handle sitting next to her everyday, loving her like you do? The protocols are so vague and we aren't an ordinary starship crew." A deep sigh was the only thing that she heard for several seconds. When he did speak again, he sounded pensive. "My friend, that's a question that I can't answer anymore." "Well if you ask me, I think you need to find your Maquis backbone again. Maybe that's what she's waiting for." Torres chuckled, sardonically. "Of course, look who's talking. It took a near-death experience for me to have the guts to tell Tom how I felt. Well goodnight, Chakotay. Try to enjoy the rest of your time off. I'm not letting you have a minute more than the week." The midmorning sun shined brightly into Chakotay's room. Its warmth brought him out of his slumber. When he checked the time, he was surprised that he had even slept and for so long. After quickly dressing, he went to the breakfast room. Kathryn was seated in her chair facing the window, sipping coffee, but she was looking at a PADD instead of out the window as she usually did. Totally absorbed with what she was reading, she was unaware of Chakotay's presence. He was certain that she had somehow gotten a ship report. Resigning himself to the fact, he said gently, "Good morning, Kathryn." Chakotay wasn't prepared for the brilliant smile she gave him. Kathryn stood up and drew him to the table. Almost before he could sit down, she brought him tea along with a plate of some fruit and bread. She put her free hand on his shoulder as she placed the meal in front of him, letting it linger there several seconds before she sat down again. "I've decided to plan the day for a change," she said cheerfully. "Not that your plans weren't great, but I realized this morning that you've done all the work. Here's what I designed." Kathryn placed her PADD so that he could see it. "We'll sail to the little atoll to the east, have a picnic, and explore the tide pools. I remembered how you loved to sail, so I found my program and downloaded my sailboat and landing." She pointed out the window. The shore area had been transformed. It sported a tiny pier and next to it was moored a sailing vessel with the name "New Earth Revisited" on its side in bold letters. Chakotay rubbed his eyes and even looked for the full moon symbol that would be a sign that he was dreaming. However, all that was to be seen was the bright cloudless sky. What could this mean? Did he dare hope? 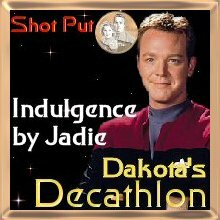 The grin on Chakotay's face told Kathryn that she had done well when at the last minute, she had decided to change the boat's name. Maybe she could change other things as well. When she saw that Chakotay had eaten the last of his breakfast, Kathryn jumped from her chair and grabbed his hand, tugging lightly. "Come on, lazybones, we don't want to miss the tide." With delight in his heart and laughter on his lips, Chakotay held her hand securely as he follow her to the dock. Chakotay lifted Kathryn from the ship's deck to the pier. They stood side by side, looking over at the boat. "I can hardly believe we were able to pack so much into a day," Chakotay finally spoke as he put his arm around her shoulders. "You know, I've never gone snorkeling in my life. It was wonderful! Thank you, Kathryn." "You're welcome." She flushed with pleasure. "I've always loved the water. Even got myself in trouble with my father on the Mars colony when I was a teenager for swimming in one of the quarry lakes with no adult supervision." As they strolled back to the hotel, Kathryn told him more about the mishap in which Mark almost drowned. "It sounds to me that even as a young woman, you put others before your own safety." Chakotay was grateful that episode was long over. "A great quality in a captain, but not always what a parent wants to see in their kid." The colors of twilight painted the sky and reflected in the highlights of Kathryn's hair. Chakotay resisted the urge to bury his face in it. Instead he shifted his hand from her shoulder to rest on the base of her neck. The feel of the amber silkiness flowing over his hand made his breath quicken with yearning. To break the spell before he trespassed some parameter, he moved his hand to clasp hers, and asked, "Do you have plans for dinner?" Kathryn was filled with both gratitude and disappointment at Chakotay's withdrawal. What did she expect after so many years of putting up barriers? He was only doing what he was sure she wished. Did she have the courage to breach the walls she had so earnestly constructed? She hoped to find out before the evening was over. "Let's meet on the balcony within an hour. I want to change and have a long soak." "Are you sure you're not part mermaid?" he teased. "Watch it, mister!" Her eyes twinkled as she tried to glare at him, her hands on her hips. "Oh yes, ma'am! I would love to." A lazy, sensual smile played on his lips. Kathryn shook her head; her glare dissolved into a gale of laughter. "I'll see you later." Once again Chakotay indulged in the luxury of watching his captain. The sway of her hips and the gentle curve of her body as she walked away from him caused his heart to race. It could be a rough night for him. The last one before this little exercise in leadership training would come to an end. In a way he would be glad when it was over. But as he made his way to his own quarters, he remembered what B'Elanna had said. Was Kathryn actually waiting for him to muster his Maquis courage to scale those walls? Not wanting to be late for their final dinner of the week, he hurried to his room. After looking through everything he had brought to wear, Chakotay chose to replicate something different. After a shower and a shave, he dressed walked to the lobby, full of purpose. The large room was empty and quiet. Chakotay found a place to stand half hidden behind a potted palm to await Kathryn's arrival. Somehow he knew that he would be bowled over by her appearance. He wanted a bit longer to savor that sensation. Kathryn seemed to float in the room. The dress she wore was at the same time green, blue, and gold; sleeveless with the neckline high in front and to her waist in the back, and the fabric of the skirt cascading nearly to the floor. He was happy that he was behind the plant for those first moments. However, Chakotay left the shadows when he saw her searching for him with evident disappointment at not finding him. "Good evening, Kathryn." His voice was low and husky as he approached her, took her hands, and pulled her against him. His kiss was quick and hard. Then he stepped back, keeping one of her hands in his grasp. "What else is on the menu?" The moment that she saw him emerge from the shadows, a thrill of desire and almost fear snaked through her. He was wearing black; the shirt, open at the neck, a leather vest, and twill pants. Kathryn felt deja vu. It was as if she was meeting the enemy Maquis captain for the first time. Only this time he was her best friend and the man she trusted above anyone else. The kiss only fed the longing and the anxiety. Just as Kathryn had thought earlier, she didn't want to stop at one, and she wasn't able to erect the barriers like before. Finally she said, shakily, "You'll have to wait to find out. Dinner will be served as soon as we get there." She led him out to a small gazebo, covered in tiny lights. A table was ready for them, and a waiter watched for a signal to serve them. Chakotay held her chair out for her just as he had each night before, but this gesture seemed different, more deliberate. Letting go of the chair, he glided his hands slowly down her bare arms as he bent to bury his face in her hair, breathing deeply of its fragrance. Just as Kathryn let herself relax against him, he moved to his chair. Kathryn had ordered all of Chakotay's favorites for the dinner, starting with mushroom soup. She watched as he began to eat heartily from the steaming bowl in front of him. What was wrong with her? All week she had had an appetite at every meal, and now all she could think of was a different kind of hunger. Taking smalls bites of the soup, she tried to think of anything other than the way his muscles pushed against the thin fabric of his shirt when he lifted his spoon or the way he had combed his hair so that it fell forward nearly obscuring his tattoo. Her fingers ached to move that hair so that she could see the marking better. Even it looked darker, more dangerous. "You aren't eating." Chakotay met her gaze as he put his spoon in his now empty bowl. "The soup is delicious." He ran his tongue over his lips and watched as Kathryn swallowed hard before she spoke. "I guess I'm still be full from lunch." Her statement sounded lame even to her own ears. As the second course was set on the table, Chakotay grinned and said, "I'm sure that's it." After serving Kathryn a small portion, he helped himself to the pasta and vegetables. "Just save room for dessert." This time he winked at her as he lifted his fork. Through the rest of the meal, Kathryn felt like she was in a fog, a fog of yearning and warmth. She was couldn't seem to find her way out. Yet in the midst of the haze, Chakotay was the lighthouse and the rocks, both. Was it possible that the time had come to throw out vague protocols and indulge her feelings? Abandoning any pretence of eating, she put down her fork after two tiny bites. When Kathryn saw the look of concern flit across his face for a second, she decided it was time to act. In a shaky voice, she said, "I'm afraid, Chakotay." Instinctively she reached for his hand. After giving orders to the holo-waiter about the rest of the meal, Chakotay took Kathryn's hand and helped her to her feet. The vulnerability he saw as he looked into her face struck his conscience, but he could still see the trust she had in him as well. That steeled him in his course of action. "Let's go where we can talk more comfortably." Chakotay led her to a cozy settee on the balcony. He sat down, resting his arm on the back of the seat. "Come here, Kathryn." Kathryn hesitated for a moment before she sat down, but she didn't resist when Chakotay pulled her into his arms. It felt so right, so appropriate. Those parameters didn't exist and there was no fitting reason in her mind at that moment for them to be. "What are you afraid of, Kathryn?" he asked softly. Chakotay didn't wait for her answer but began to lightly kiss her temple and hair. He might as well be in the brig for a really good reason. "Chakotay, I'm serious," she protested halfheartedly. His answering chuckle did nothing to dampen the fire that was building in her. "Please, let's talk." Her plea was what caused him stop though he did keep his arms around her. "Do you know what you're afraid of?" "Yes." Kathryn searched for the right words. "I'm afraid of the next step. What if we can't work it out? I don't know if I could handle losing someone else I gave my love to." "Were you worried when you asked me to be your first officer?" "How so?" He was insistent. "You didn't know me the way you do now, but you took a step that has been a benefit to the ship and to you and me personally." Kathryn pondered the idea. "Is it that simple? What if we make it home? What if we just can't make it work? What if you die?" The questions poured out of her like a flood. "Look at me!" he told her gently. When Kathryn tilted her head back so that she could see him, Chakotay continued, "Yes, it is that simple. Whether we are here or the Alpha Quadrant, we will be together. I happen to think we're one hell of a team. We have faced and overcome more obstacles in the past few years than most couples do in fifty and will keep on doing so. I know that I can't promise that one of us won't die, but I know my heart would break if I lost you, with or without the memory of us being together." He saw tears glistening in her eyes as the impact of he said dawned on her. Reaching his hand to cup her cheek, Chakotay's smile brightened as he said, "Kathryn, I love you. I want to spend the rest of my days being able to show you how much. Please, let's not waste another minute of the lives we have left." "Oh, I love you, too, Chakotay!" Her tears spilled over but her smile was dazzling. Kathryn wrapped her arms around his neck and kissed him. The mist of apprehension and doubt vanished as the damped fire of longing leaped to full blaze. She wanted no more than to lose her being in that heat. Just as she began to pull at the buttons of his shirt, Chakotay stopped her. Breathlessly he said. "Wait, Kathryn, not so fast." "I love you." She pushed forward, trying to kiss him again. More urgently she said, "I want you." "I want you, too," Chakotay declared fiercely, pulling her tightly against him. "But I'm not looking for a one night stand or even an affair. I want to marry you." Kathryn blinked in astonishment. "Marry me?" "Yes, will you marry me, Kathryn?" There was a hint of nervousness in the question. "Be my wife." Her heart beat rapidly. Somehow with Chakotay's arms around, she only had one question. "When?" "Right now! Wait let me explain." After only a few minutes of listening to what Chakotay had to say, Kathryn was convinced. She leaned her head back on his shoulder, smiling from ear to ear. "I'm marrying a brilliant man." "Who shall we invite?" It was the universal question of all weddings, big or small. Chakotay thought for a moment. "Just Tuvok, Tom, and B'Elanna. We can have a large reception for the whole ship, but if we want to get married tonight, two witnesses and the officiant is all we need." As if to convince her that an immediate ceremony was best, he kissed her again, slow and seductively. "Arrange it, quickly," she moaned in frustration. "Paris here." Voices and laughter could be heard in the background. "I want you to contact Tuvok and B'Elanna. We want the three of you here in 30 minutes." "But Chakotay," Tom complained, "we having a themed back-to-normal party in the mess hall. Neelix is trying to make it up to me for messing up that trade for me." Chakotay grinned and said sincerely, "We won't keep you long. But the captain and I need your help." "Okay, if you're sure. I'm off duty and the costume judging starts at 2130 hours." "Yes, I'm sure. And I promise that you will be back in time. Chakotay out." "I told you I don't know why they asked us here," Tom answered B'Elanna for the second time. They arrived outside the holodeck still dressed in their costumes at the same time Tuvok did. "I think it's pretty strange that they called us," she insisted. Tuvok stood next to the couple, Vulcan disapproval evident on his face. Before Tom could explain to Tuvok why he and B'Elanna were dressed as they were, the doors opened with a soft swoosh. Stunned silence filled the air when the two couples saw what the other was wearing. It wasn't often that they saw the command team out of uniform, but seeing Janeway in the long green blue gown and Chakotay clad in black with their hands clasped, left Tom and B'Elanna speechless with astonishment. On the other hand, Kathryn and Chakotay fought bubbling mirth because Tom and B'Elanna each were wearing a tee shirt with the same words printed in the front. "I'm with stupid," it read, with an arrow pointing in the other's directions. Tuvok stood by impassively, with only a twitch of an eyebrow to show that he was, at least, slightly discomfited. Chakotay was the first one to find his voice. "What kind of party were you having?" he asked, clearing his throat. "A funny tee-shirt party, of course." Tom was a little worried, so he added. "I couldn't find any regulations against it." "Relax, Tom," Kathryn said as she saw his discomfort. "Or should I call you, Captain Paris?" "Indeed." Tuvok had his misgivings about Tom Paris being acting captain, but at least the young helmsman should be afforded his due respect in his temporary position. "Since Chakotay and I will be private citizens for less than 24 more hours, we would like to ask Captain Paris to marry us according to his authority given by Starfleet regulations," Kathryn stopped to let her announcement sink in. "And B'Elanna and Tuvok are here because we needed two witnesses." Again the three latest arrivals were dumbstruck for several moments. Finally Tuvok found his tongue. "Are you sure this is a wise course of action?" "Tuvok, my old friend," she said, affectionately, "I can see no more logical alternative." He nodded solemnly and took his place next to the unusually quiet Torres. Later Tom would recall that it felt dreamlike standing in front of Janeway and Chakotay, reading the wedding ceremony from a borrowed PADD with Tuvok the only one there in uniform. The only thing that seemed real, according to Paris, was the kiss that Chakotay gave his new bride. Telling anyone who would listen, he insisted that Chakotay wouldn't let the three of them stay much after that kiss, but it only took a promise from Janeway of a reception a week later and the charge from Chakotay to rethink protocols to convince Tom to remain in command for the next seven days. When the others left, and the holodeck doors were closed and locked, Chakotay lifted Kathryn into his arms. "I can walk," she gave a token protest, laying her head on his shoulder. "Isn't there an old earth custom about carrying the bride over the threshold?" He made his way to the bedroom. Not waiting for her answer, he said, "I love you, Kathryn, my wife." "And I love you, Chakotay, my husband," she said, then she indulged herself again as she kissed him.